A small crowd stands for a moment of silence during a protest against the National Rifle Association in Dallas, May 5, 2018. Protesters on both sides of the U.S. gun debate took to the streets Saturday outside the National Rifle Association’s annual meeting in Dallas after the latest in a long series of mass shootings put the issue back in the spotlight. Across the street from the convention center where President Donald Trump addressed NRA members Friday, a “Rally4Reform” drew about 200 demonstrators demanding tighter restrictions on firearms sales. Many were dressed in the orange that has become the color of the gun control movement. 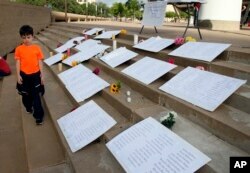 Thomas Baughman, 9, of Dallas, walks past displays with names of people lost to gun violence in Texas, during a protest at City Hall in Dallas, May 4, 2018. The annual National Rifle Association convention is being held nearby at the convention center. An estimated 80,000 people were expected in Dallas for the NRA’s three-day meeting, which began Friday. 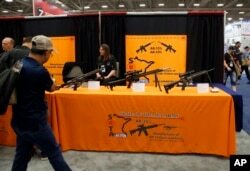 Attendees walk by a display of AR-15's and AR-10's at the National Rifle Association convention in Dallas, May 4, 2018.